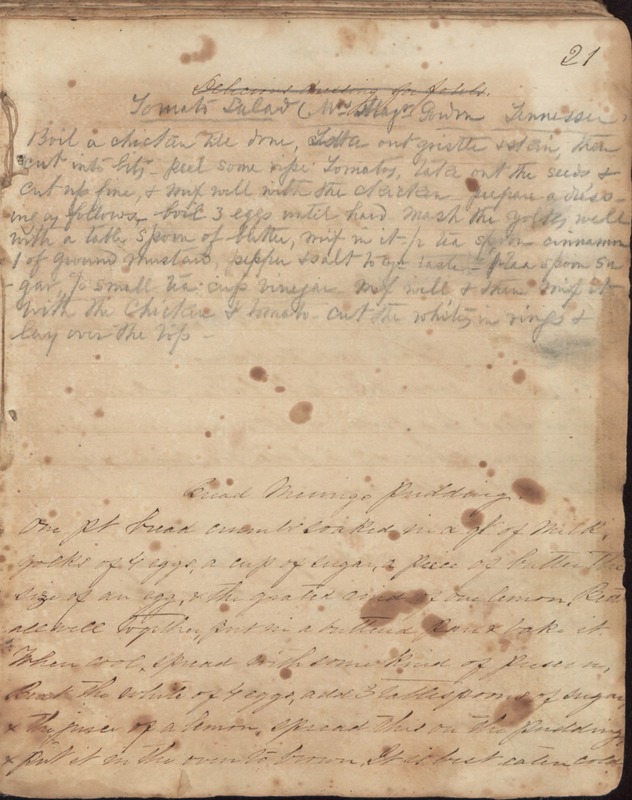 21 Tomato salad (Mrs. Mays [illegible] Tennessee) Boil a chicken till done, [Take?] out gristle + skin, then cut into bits - peel some ripe Tomatos, take out the seeds + cut up fine, + mix well with the chicken - prepare a dressing as follows, boil 3 eggs until hard. Mash the yolks well with a table spoon of butter, mix in it 1/2 tea spoon cinnamon 1 of ground mustard, pepper + salt to yr taste - 1/2 teas spoon sugar, [illegible] small tea cup vinegar. Mix well + then mix it with the chicken + tomato. Cut the whites in rings + lay over the top - Bread [Meringe?] Pudding One pt bread crumbs soaked in a qt of milk, yolks of 4 eggs, a cup of sugar, a piece of butter the size of an egg, + the grated rind of one lemon. Beat all well together, put in a buttered pan + bake it. When cool, spread with some kind of preserve, Beat the white of 4 eggs, add 3 tablespoons of sugar, + the juice of a lemon, spread this on the pudding, + put it in the oven to brown. It is best eaten cold.